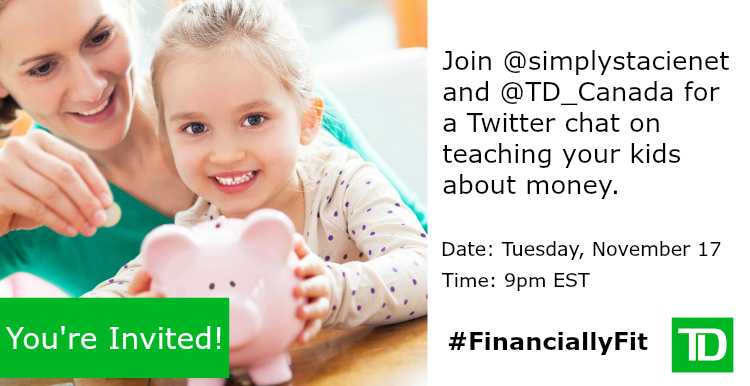 You are here: Home / Lifestyle / Parenting / Join Us For Tips On How to Teach Your Kids About Money at the #FinanciallyFit Twitter Chat on November 17th! The sooner you teach a child about the value of a dollar and what it takes to earn it, the better. Growing up, I wish I had known a lot more about money and now that I have kids of my own, I try to teach them that sometimes you have to wait to buy something. That means saving your pennies to buy what you want. Having a conversation about money when they’re young can make a huge impact when kids reach adolescence and adulthood. Who knows, it can be a Minecraft game today (or Treasure Trolls, like me) and saving for their first car tomorrow. 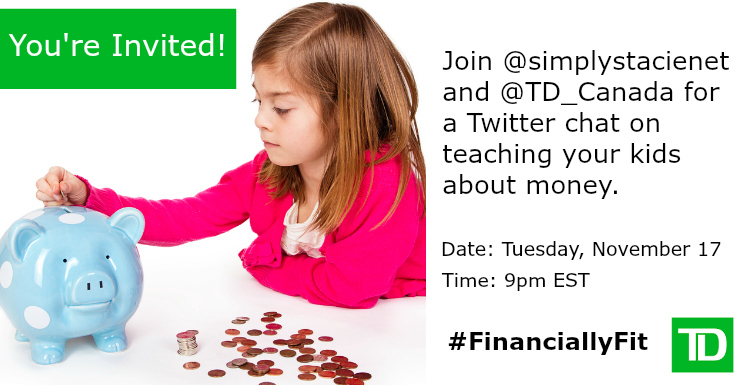 This Tuesday, Stacie from Simply Stacie with TD Canada will be chatting all about how you can start this conversation and teach your children all about money. It’s going to be a super fun hour! I know that I’m excited! Prizes: Five (5) $50 Amazon.ca gift codes. ​Eligibility: Open to Canada, excluding Quebec​. I can’t wait to learn more about how I can teach my girls about money, it is something that is truly essential. The more educated we are about it, the more we can teach them! So, don’t forget, it’s this Tuesday, November 17th at 9PM. Previous Post: « Disney’s Aladdin: Diamond Edition NOW Available on Digital HD and Blu-Ray Combo!